I have reached Granada! I am sitting in a dodgy hotel, writing as fast as possible until they throw me out – because I am not staying here. There seems to be only one internet cafe in this city, and they are on annual leave… so I begged the guy at the reception if I could use this PC for an hour or so. The browser is in Spanish and I have no spelling correction at all (so nevermind the typos). What an adventure it has been so far! It has been little over a month, and I must say: I love my new life. 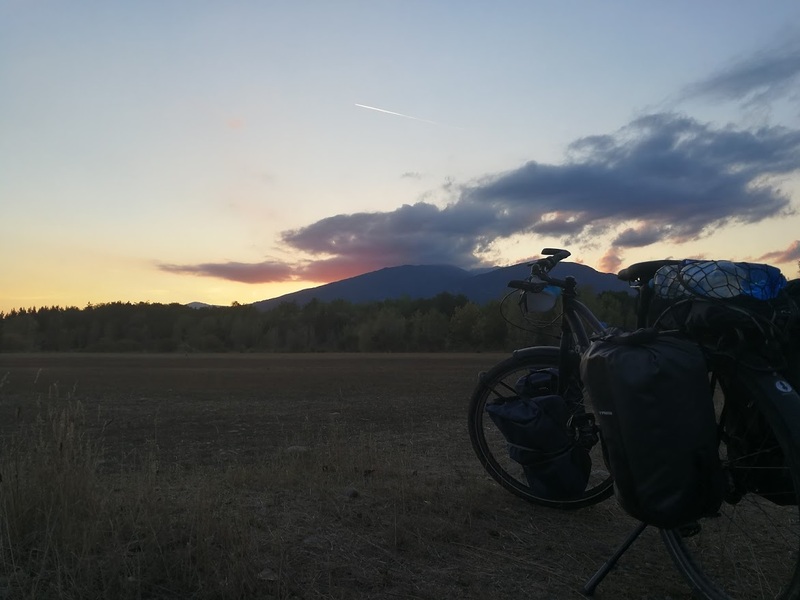 Despite the heat, fatigue of the daily rides, nights in the tent, and a bit of loneliness, I am loving every single moment. I have also embraced being alone. I just talk to strangers – in bars, gas stations, on the street, and tell them about what I’m doing and ask what they are up to. Being alone forces me to meet strangers,and that is what I want. 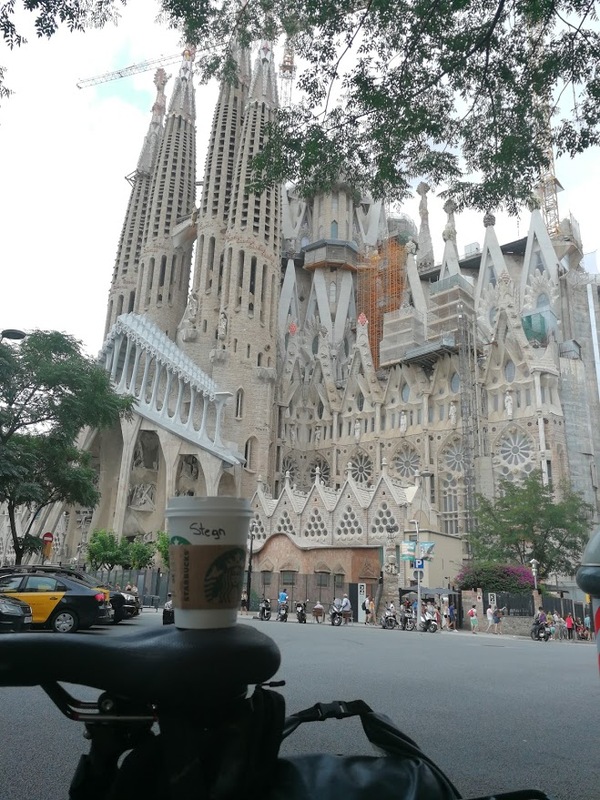 I even have an opening line “He venido en bicicleta desde Bélgica“. I usually get stuck within 10 seconds after that line, but who cares? 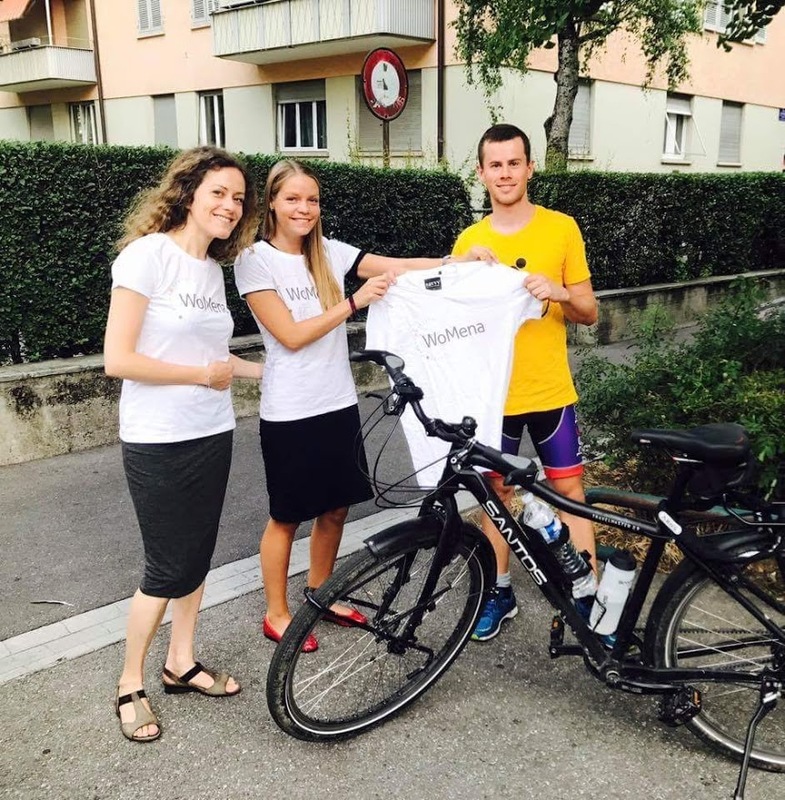 I met Petra and Marianne from WoMena in Geneva – and received a t-shirt!! 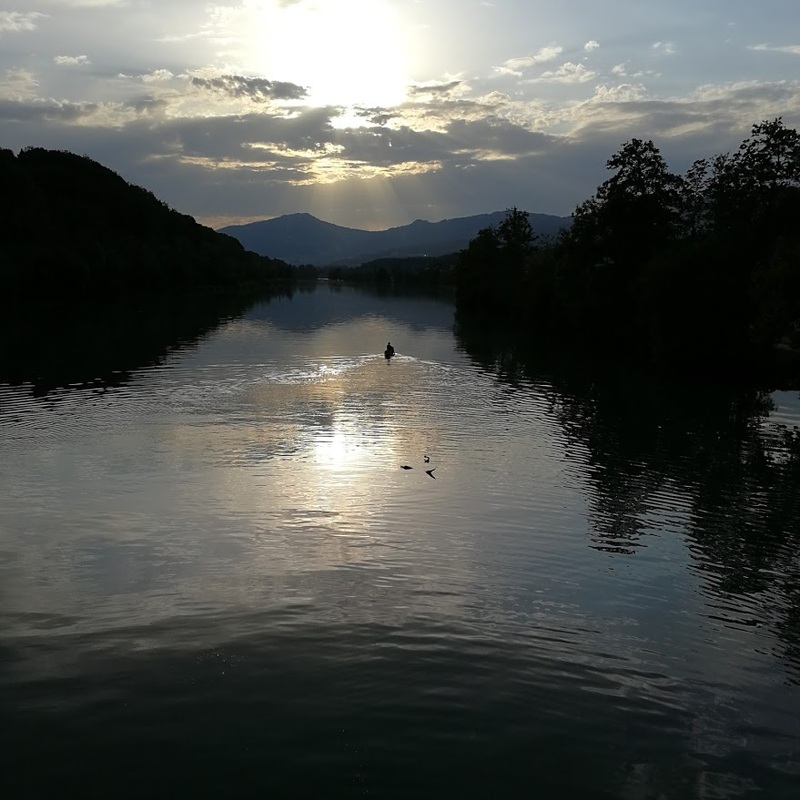 I cycled along the Rhone river in France to the mediterranean sea. 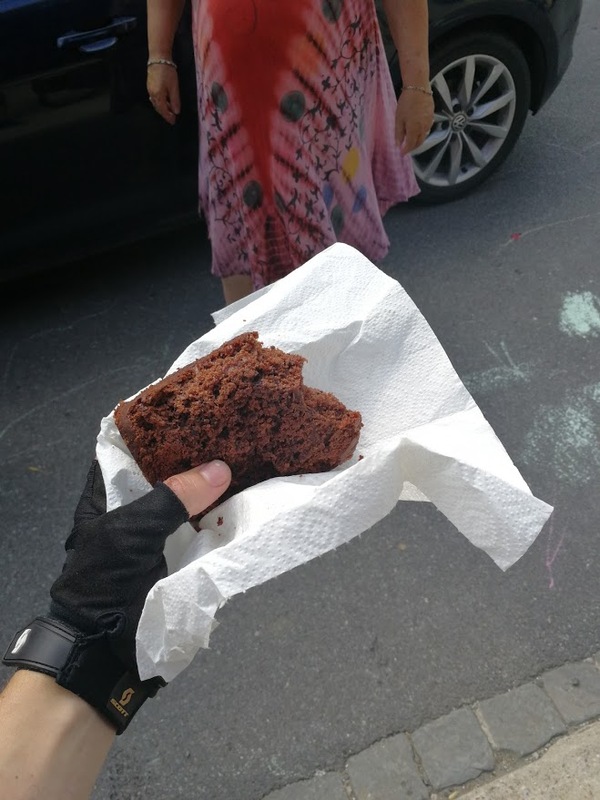 I met 3 fellow German cyclists (at different places). 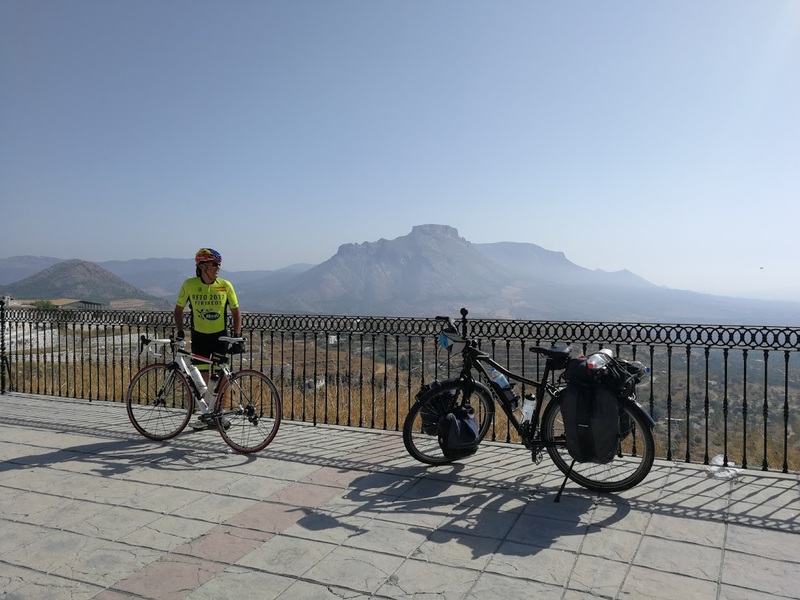 I cycled some more in Spain and met with old and new friends. It was very hot all the time! 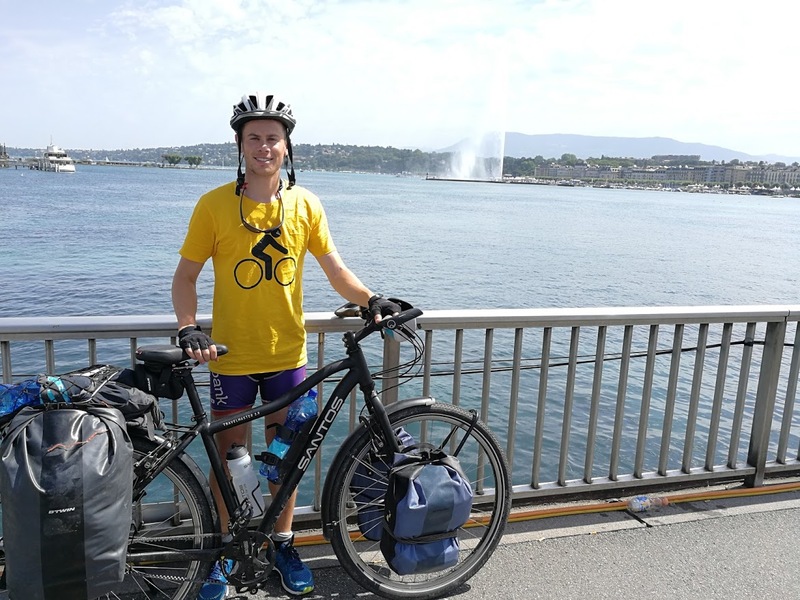 from Zurich onwards I cycled towards Geneva in three days. 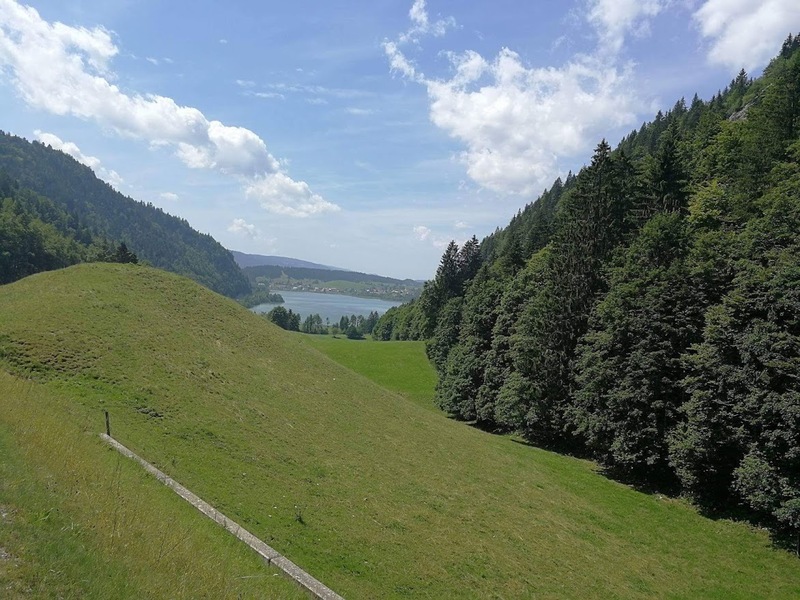 The first two days I cycled mainly along lakes and green fields, and also biked along the Aare river. 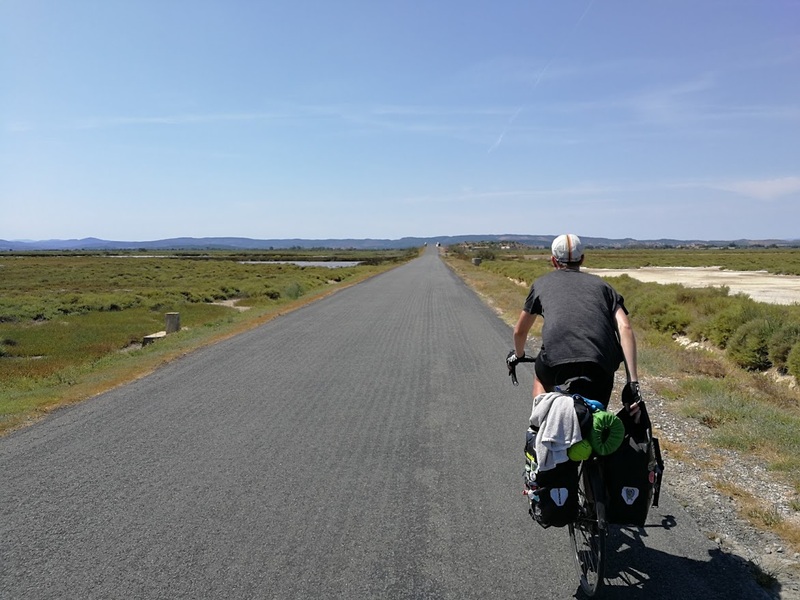 The next day I woke up with sore legs (because of the 1600m of elevation difference I climbed the previous day – Marianne´s guest bed was great), so I gently cycled to the South and into France. 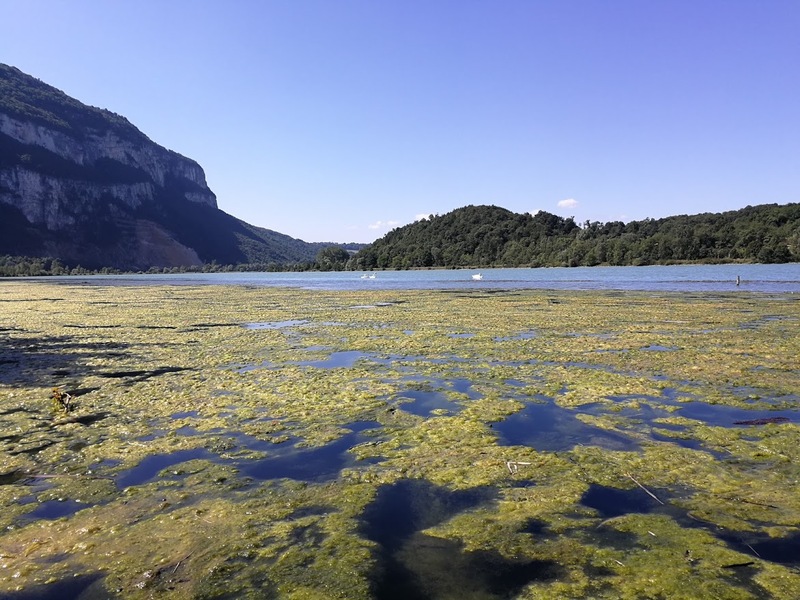 For 3 days I followed the Rhone river towards Avignon, and had a lot of fun along the way. 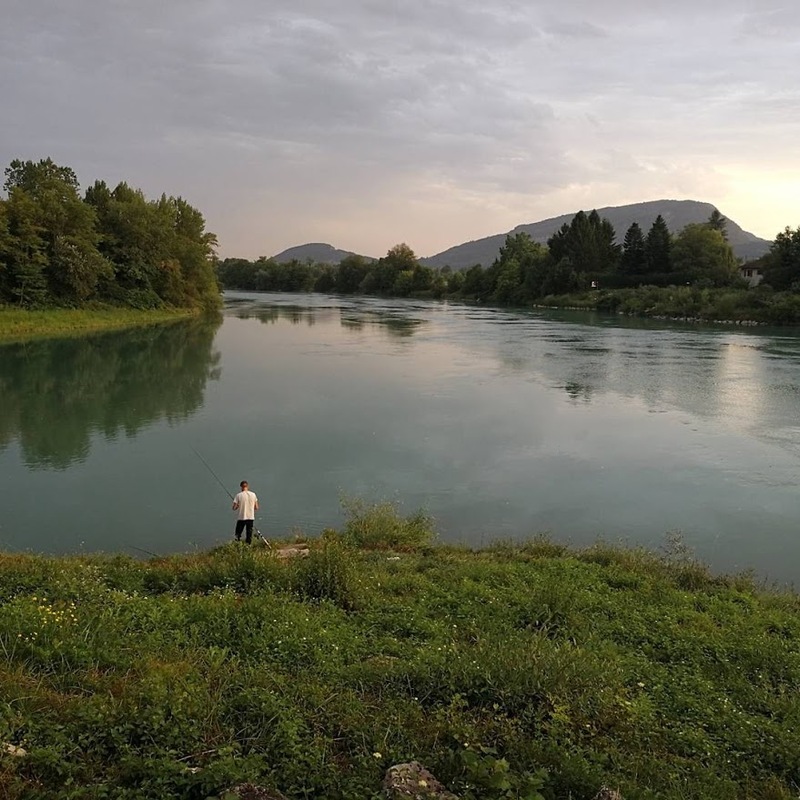 I talked with locals in bars, and I met a fisherman. 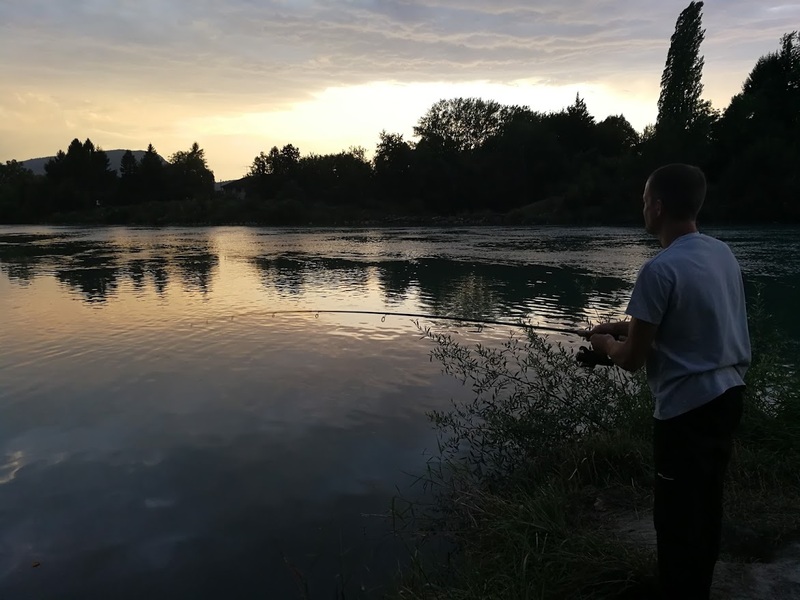 I talked to him about different fishing techniques while watching the sun set above the river. I told him about eal fishing along the canal were I grew up, as he told stories about huge fish he caught in the Mediterranean Sea. 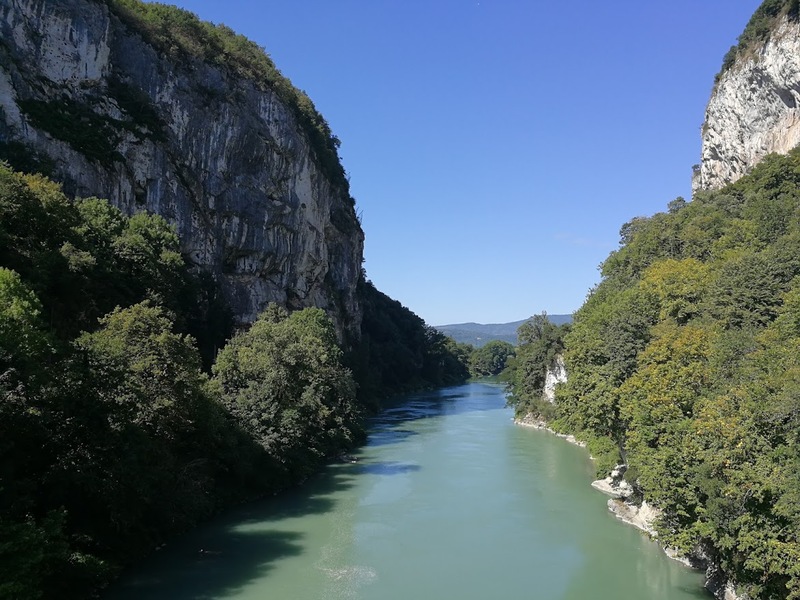 I cycled along the Rhone river for about 400km, and discovered how different the river looks as it makes its way to the sea. my bike is a real diva, always attracting attention! Saint-Genix-sur-Guiers. 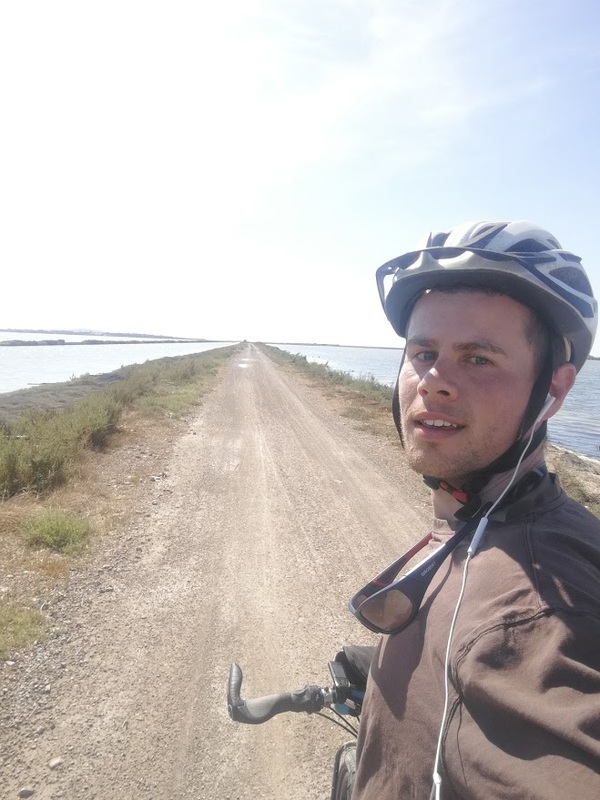 The last 50km before the Mediterranean sea I cycled in a natural park called “les Etang palavasiens”. 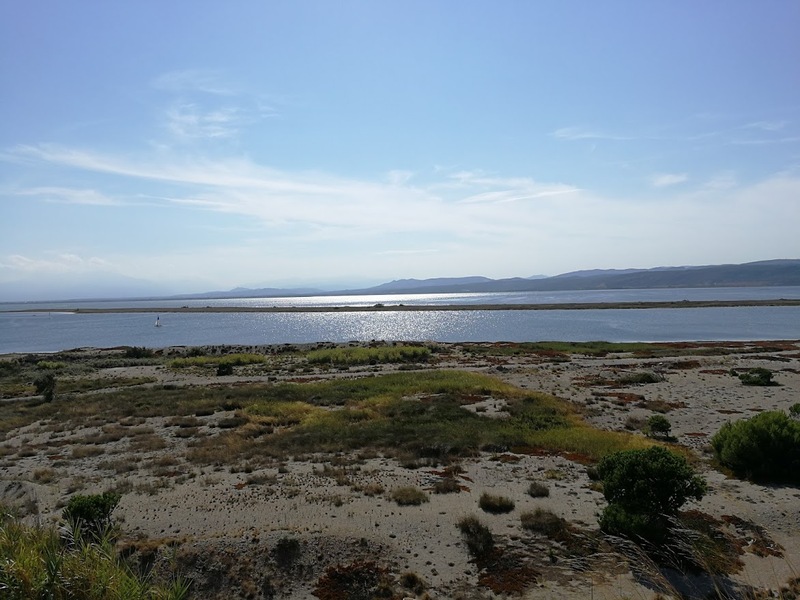 It is a lagoon-like complex with canals and lakes, and only gravel roads. The wildlife is very impressive with a wide variety of birds (some parts reminded me of “het Zwin”). At last the mediterranean sea! 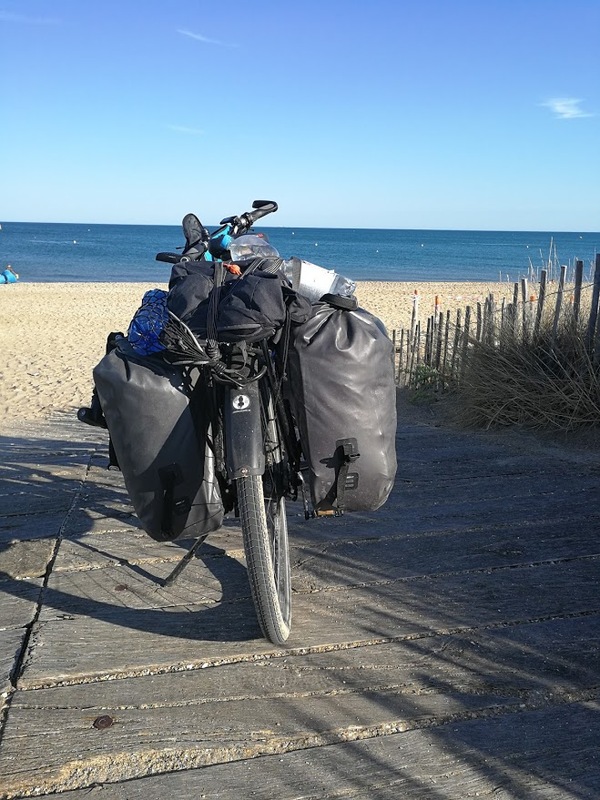 Less than a week after leaving Switserland I arrived at the seaside 50km West of Montpelier. 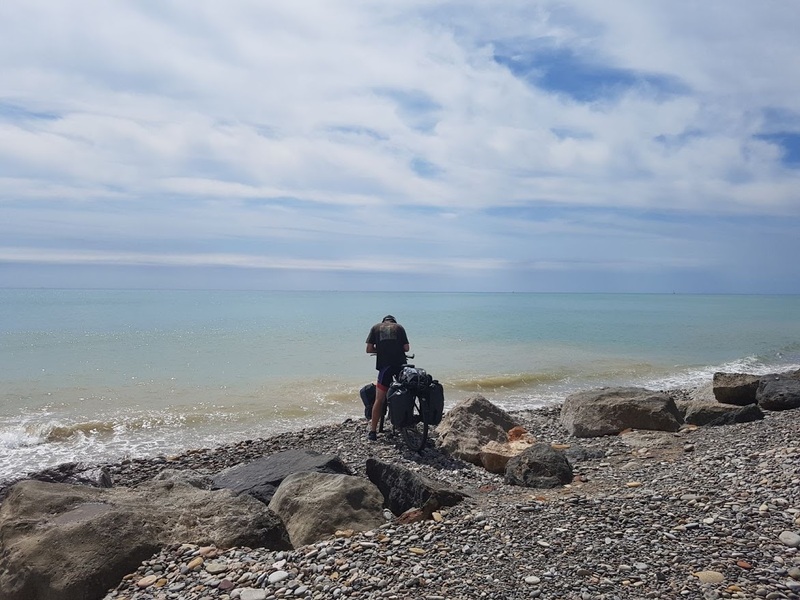 Along the coast, I met Jens, a man from Munich who was on his way to meet his girlfriend in Barcelona. 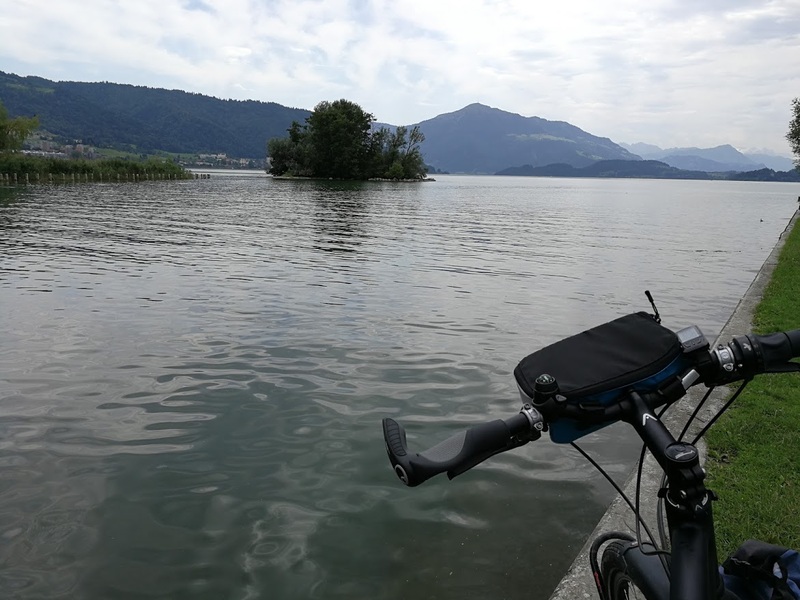 We cycled a few hours along the beach. When I cycled next to him I thought he was 30 something years old, but he turned out to be 48! Clearly cycling keeps you young! 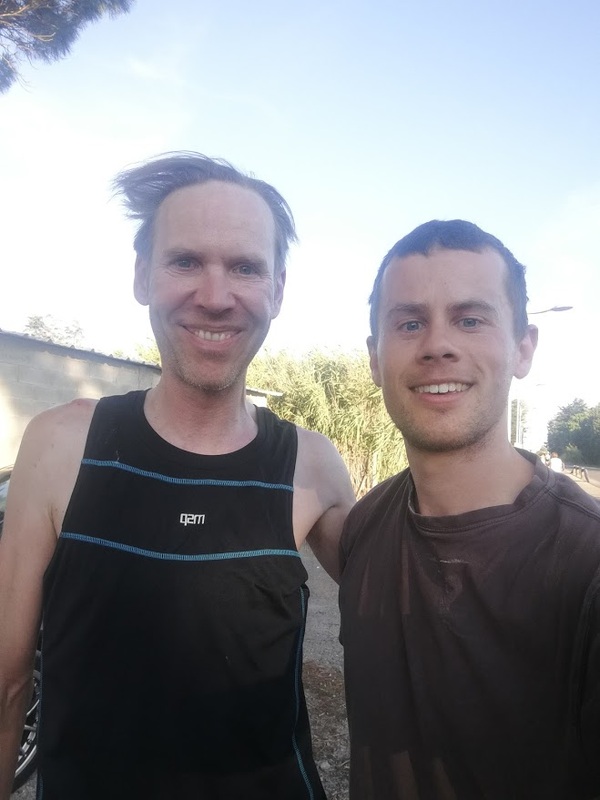 The next day I ran into another German cyclist: Nils from Karlruhe. 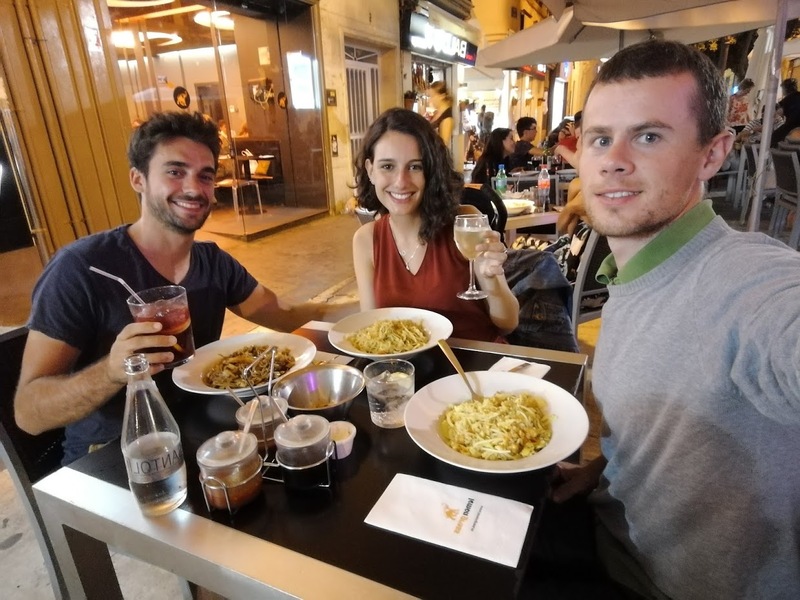 We decided to team up and cycle together to Girona. Nils turned out to be a great cyclist. He carried very little luggage, and could easily keep up 30km/h. 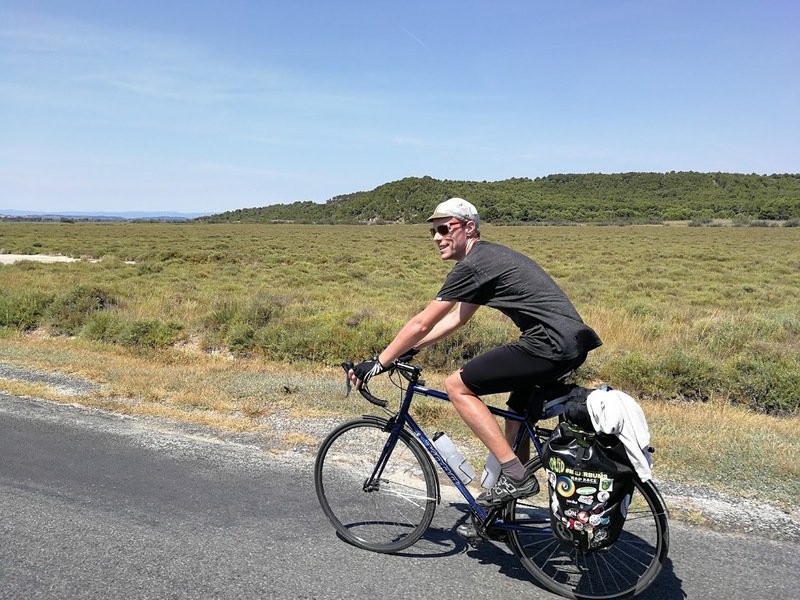 I just followed him as we did almost 200km a day for three days in a row. 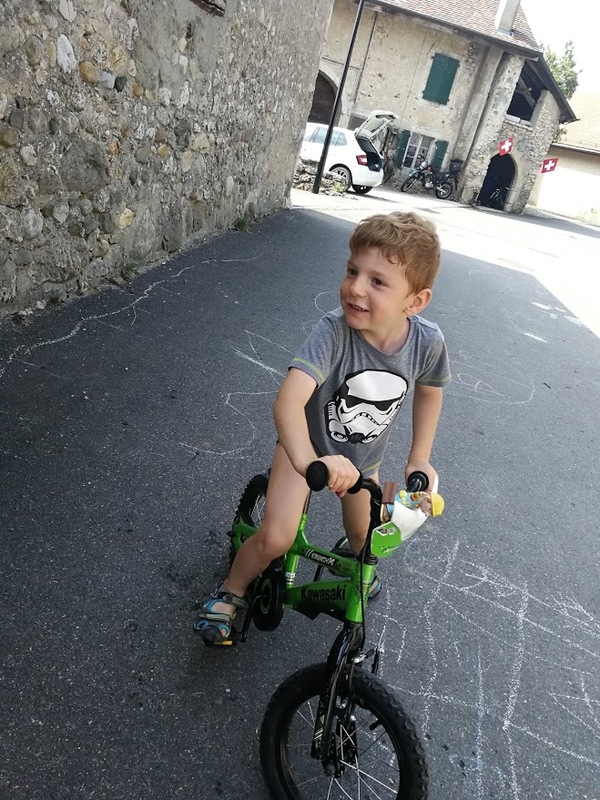 Besides being great at cycling, he also has style ;): Check out those retro sunglasses – matched perfectly with his retro bike. The hipsters in Karlsruhe should declare him king! Parc naturel regional narbonnaise mediterannee. 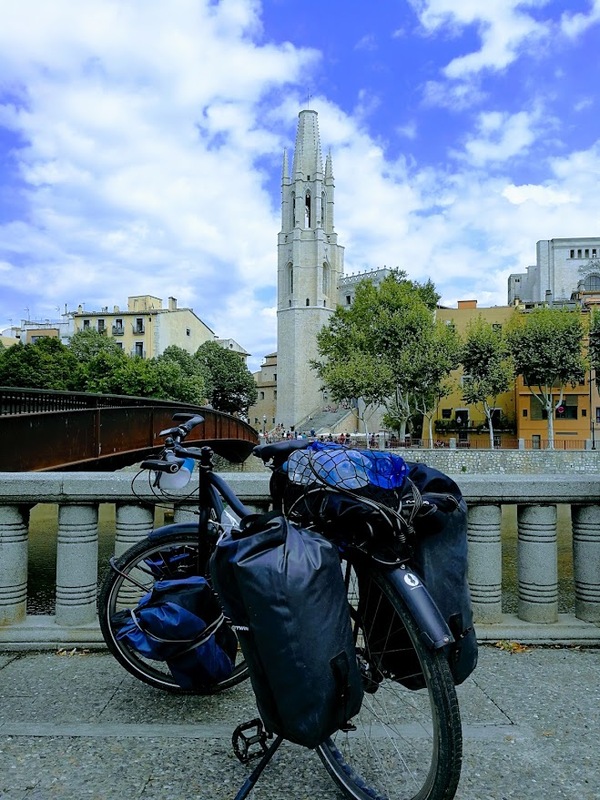 After dropping of Nils at Girona to catch a train back to Carlsruhe, I continued towards Barcelona. I started to go more off road as well. 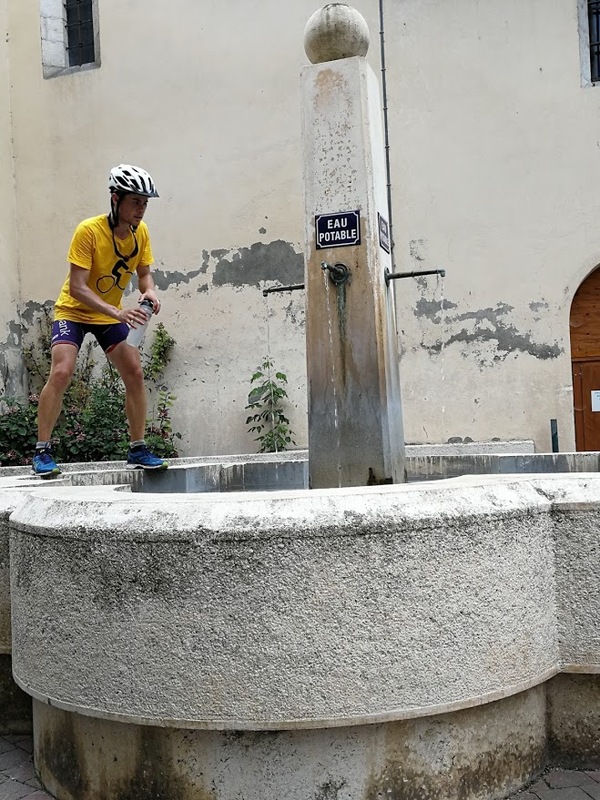 I cycled along the ‘via Augusta’. 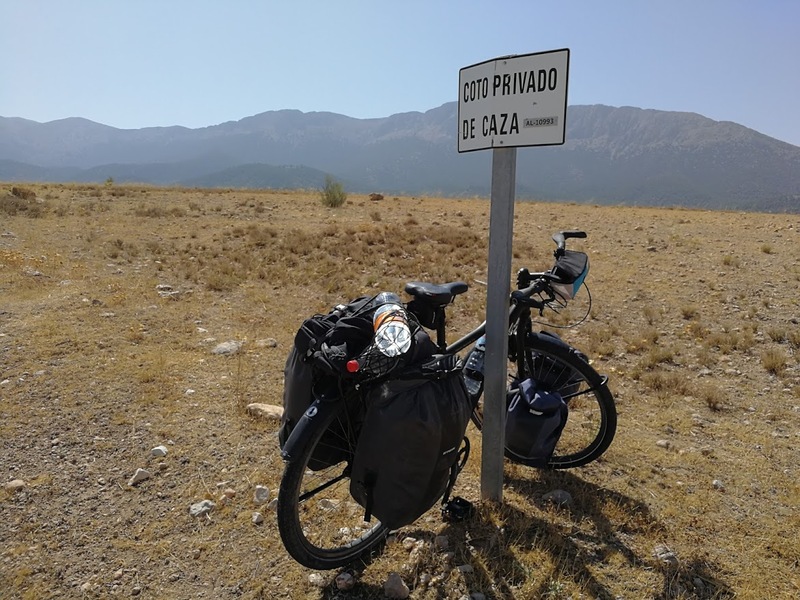 An ancient Roman road named after emperor Augusta that conected Cádiz in the southern tip of current Spain, to the Coll de Panissars (and further to Rome, as all roads used to lead there). 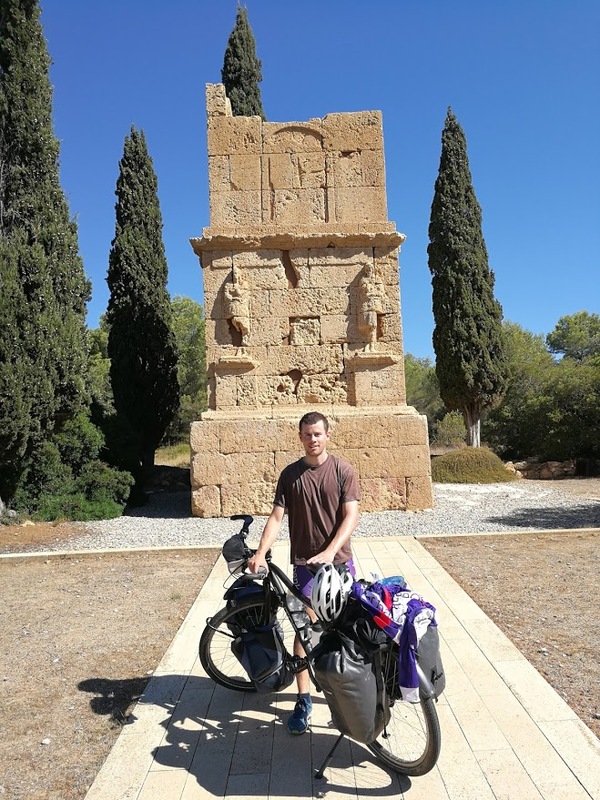 In the picture below, I am posing in front of one of the ancient relics along the Via Augusta. The deceased – who rest inside – are guarded by devine protectors on both sides. 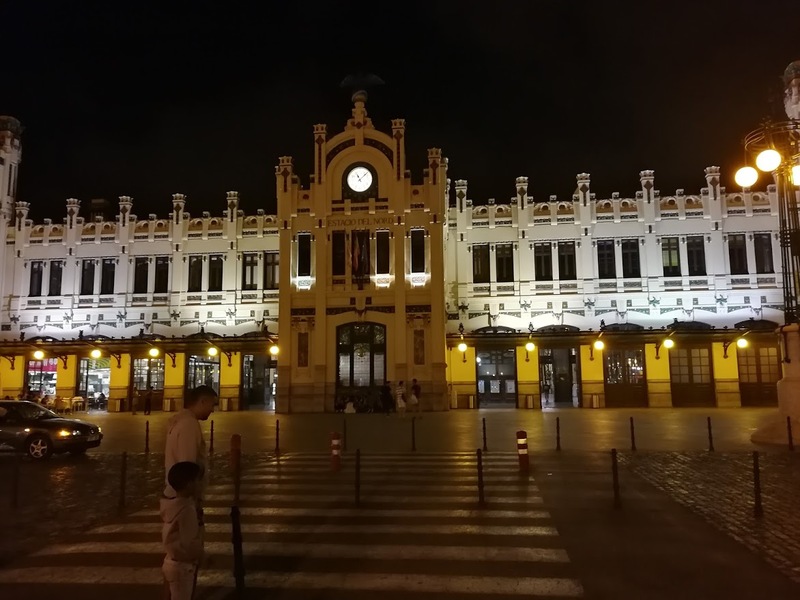 90km before arriving in Valencia, I met up with Marcos in the train station of Castellón de la Plana. 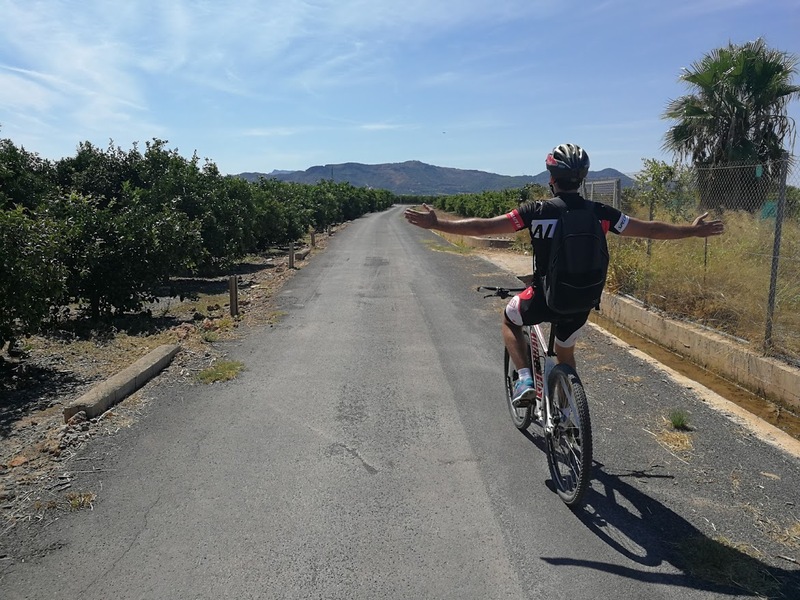 Marcos and I cycled along beautiful beaches and along fields of orange trees. we stumbled on this beach near Castellón de la Plana. It still has the traditional beach houses that have become rare along the Spanish coast. 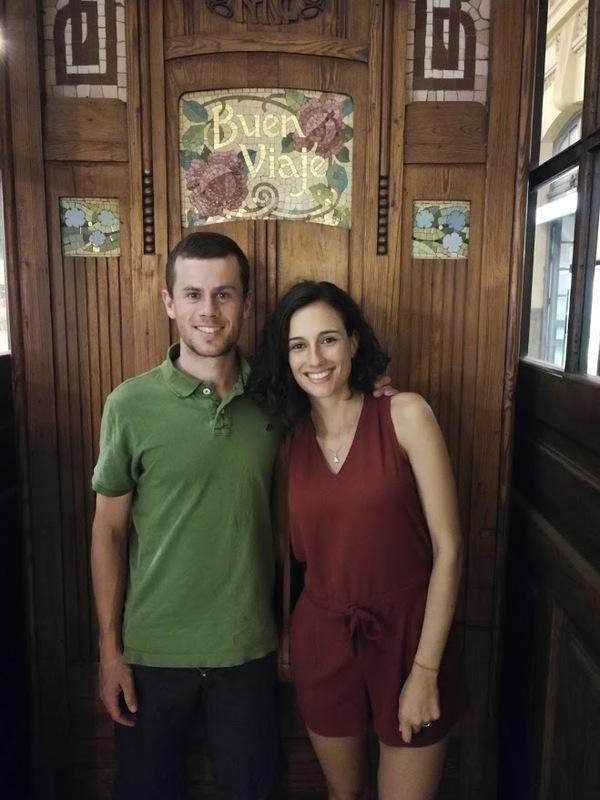 At night, Sandra and Marcos gave me a guided tour of the city. More importantly, my legs finally got some rest. Since Valencia I’ve been doing a lot of off road. 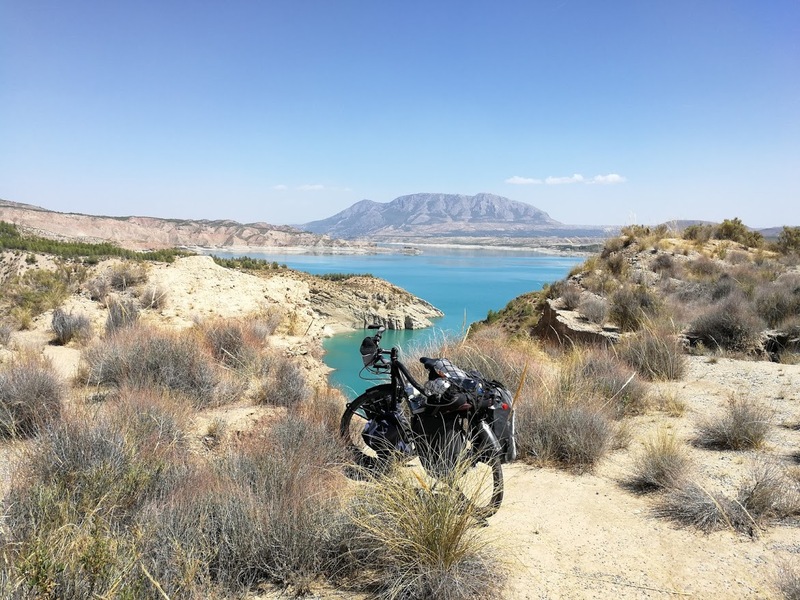 I cycled away from the coast and into the hills to avoid traffic and tourists, and to enjoy the untouched nature Spain has to offer. 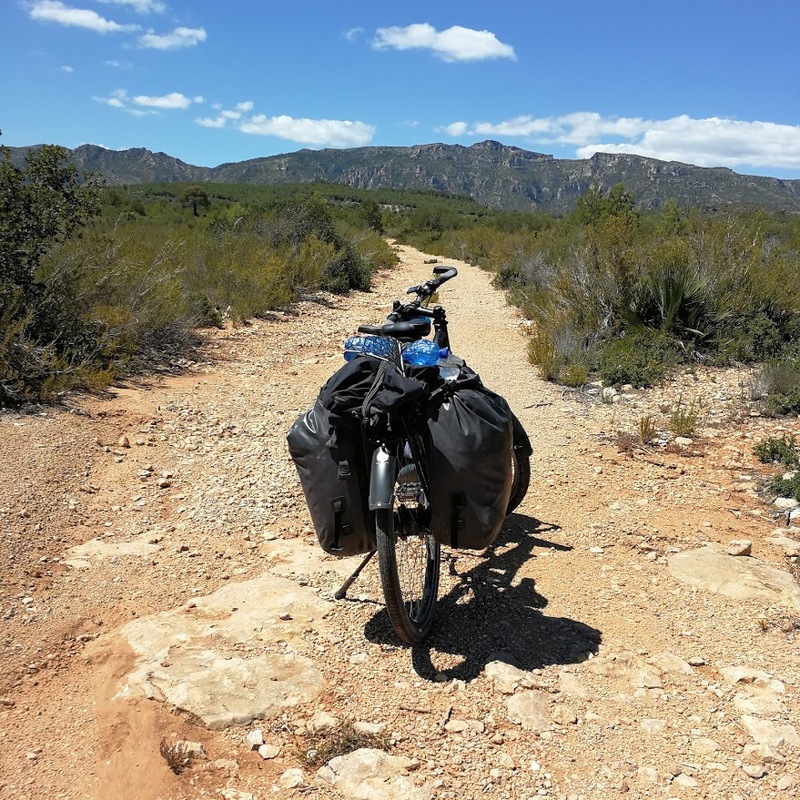 I don’t have any time pressure at this point, so I just have fun, and cycle on dirt and sand roads as much as I can. The views have been so amazing that I don’t even care about the drops of sweat and sunblock dripping into my eyes in the 35° heat. I have a love-hate relationship with dogs. Some dogs like to chase me (3 times in Spain already), but some dogs are friendly. 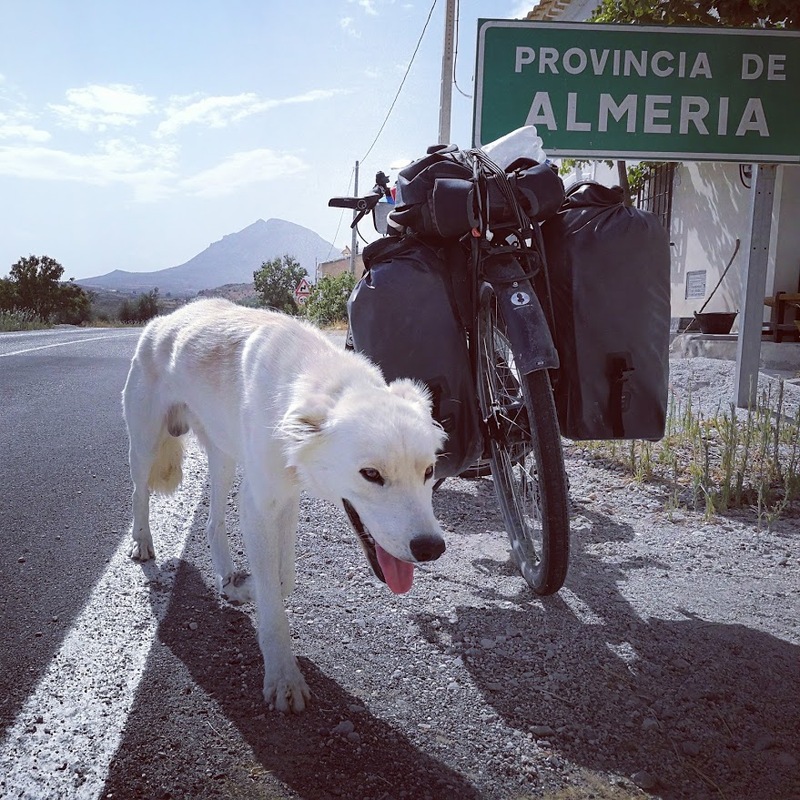 This one, who was resting in the shadow of the “provincia de Almeria” sign, smelled cookies in one of my bags. 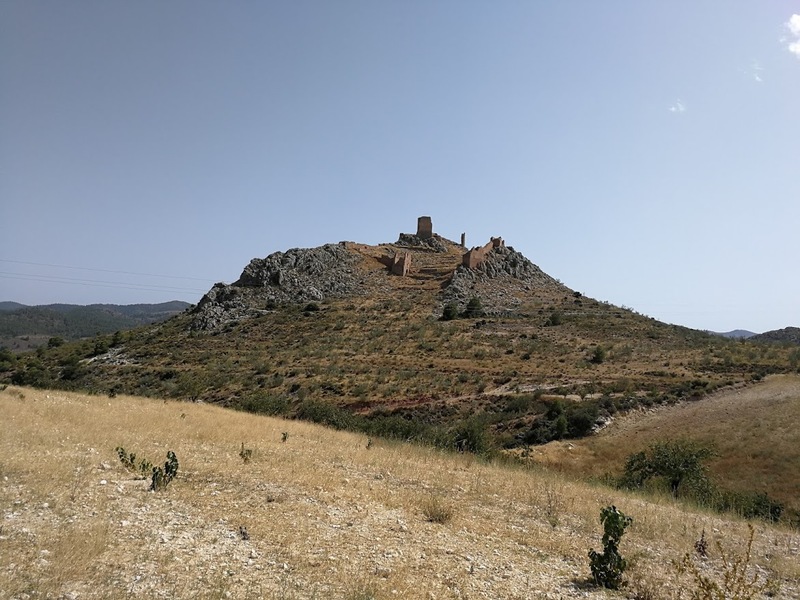 Xiquena Castle – province of Murcia – was founded during Muslim rule over the area, certainly before the 13th century, but maybe even as early as the 10th century. It was part of a large and hostile frontier area between the Kingdom of Castile and the Emirate of Granada. hills as far as the eye can see. 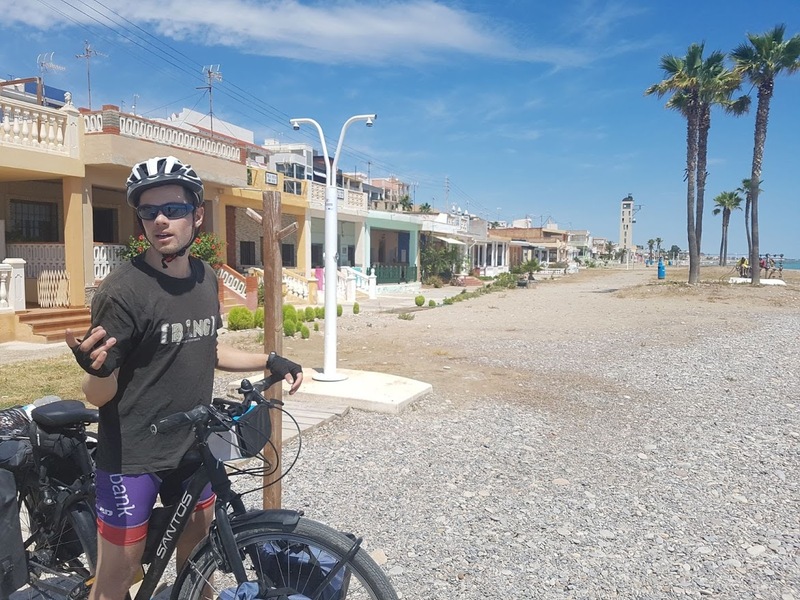 I cycled towards Valez Rubio – a small mountain village between Murcia and Almeria – where I stayed with the Bañon family (friends of my family). I had the best home made gaspacho (made by Rachel) and hung out with the family for a day. 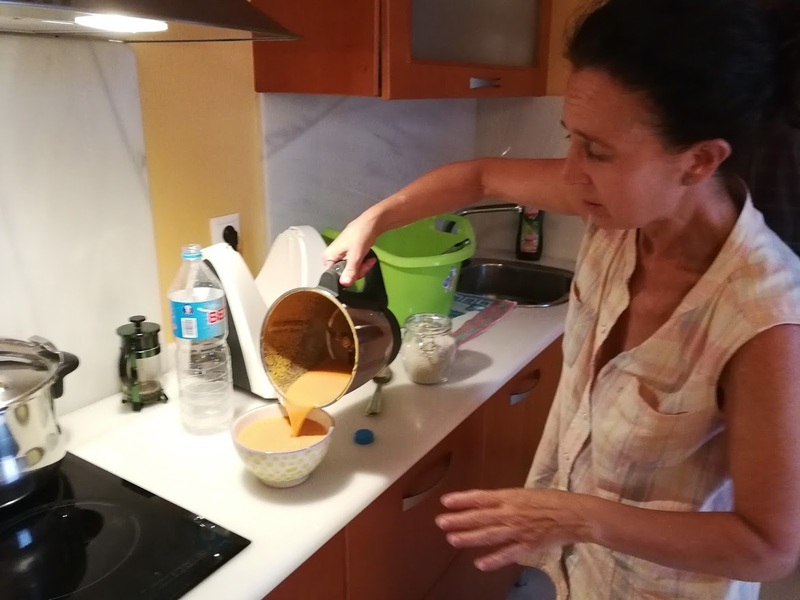 Rachel preparing the best gaspacho in the world! (she has a special machine for gaspacho). 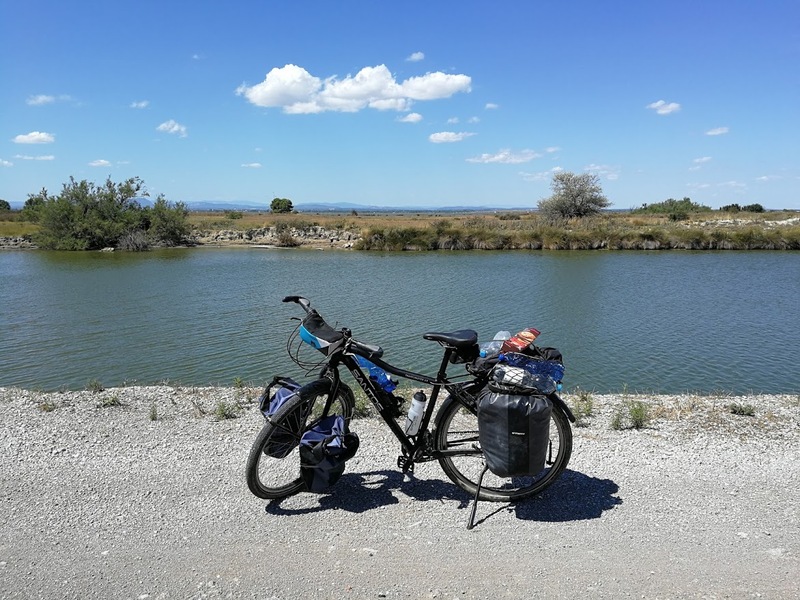 Back to business: after two days in a normal bed I loaded up the bike for some more fun in Parque Natural Sierra de María-Los Vélez. 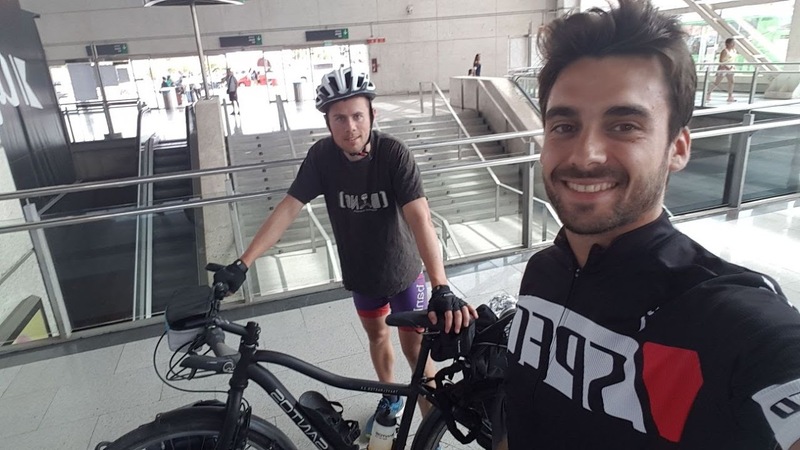 Rachel´s husband, Juan, guided me for the first 30km. 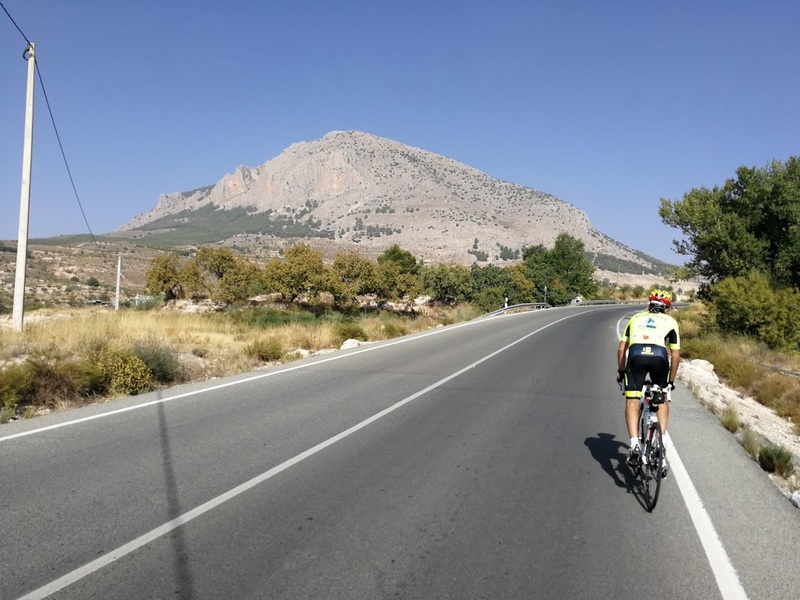 Juan is 56, is a member of the local cycling club, and he has a resting heart rate of 36 (…). This picture shows how he left me breathless on the flanks of a hill called “Maimon”. As I am making my way further South, the landscape is becoming very dry. Andalousia – Embalse de Negratín – a reservoir used to store water for agrigulture. 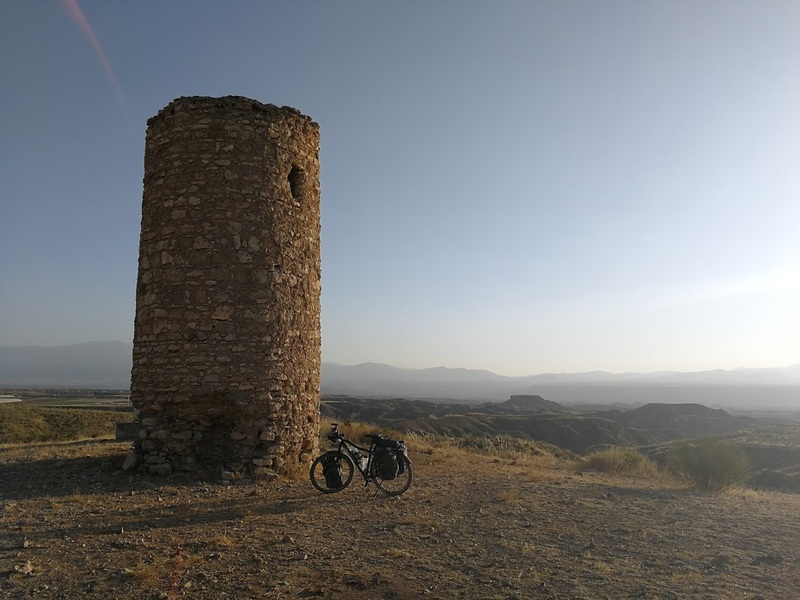 “Torre de Guajar” an old watchtower in a valley bordering the Sierra Nevada. 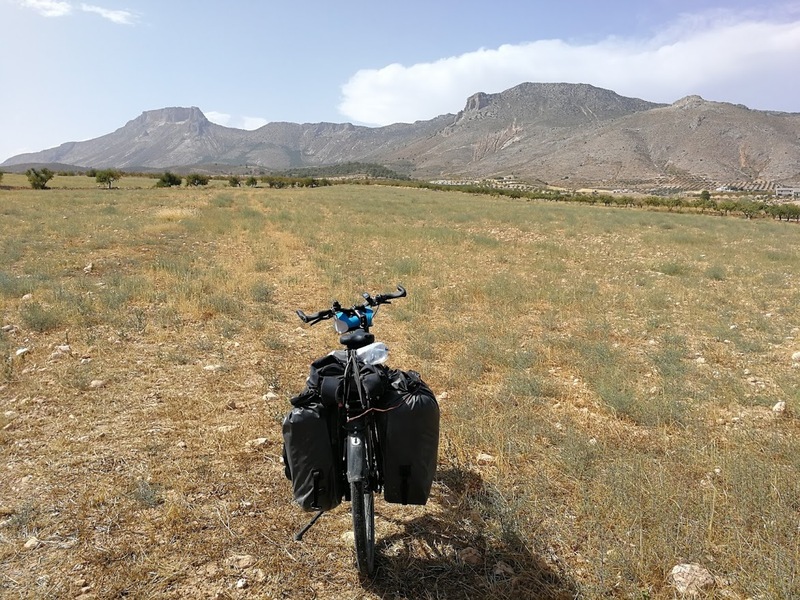 I have now reached Granada, with over 3200km in the books (I did not take pictures yet). 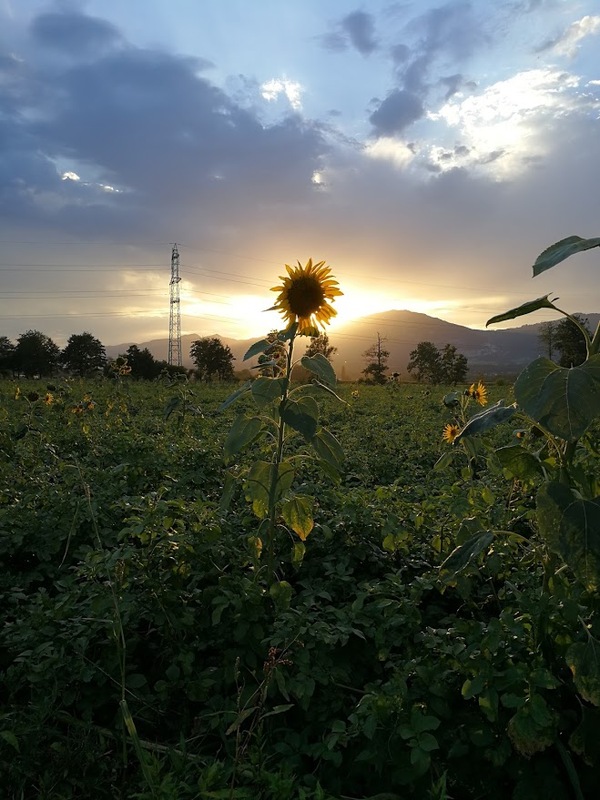 Your trip brings back so many memories…. 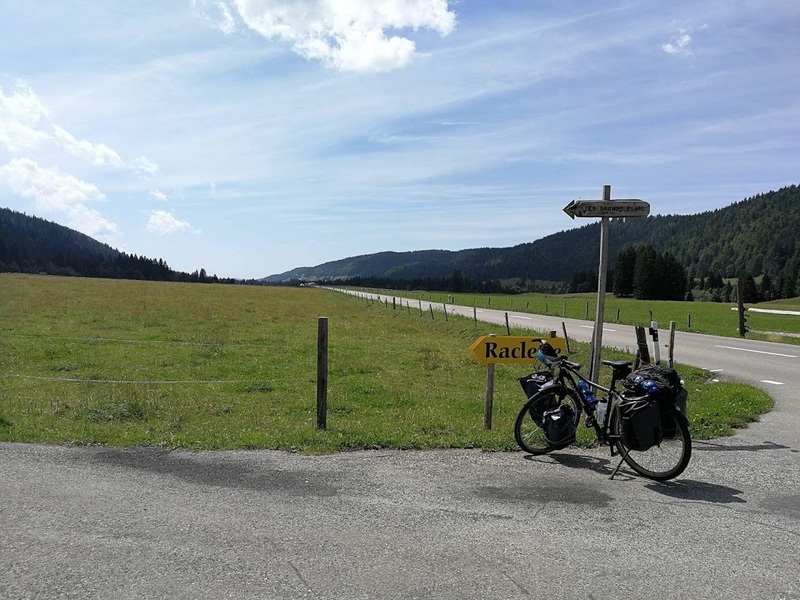 I’m at the same time jealous and proud of you… I made a bicycle trip in 1965 from Moerbeke-Copenhagen (no speed control, no side bags…), and again in 1966 to Innsbruck (walking uphill all the way, then downhill like a rocket…). 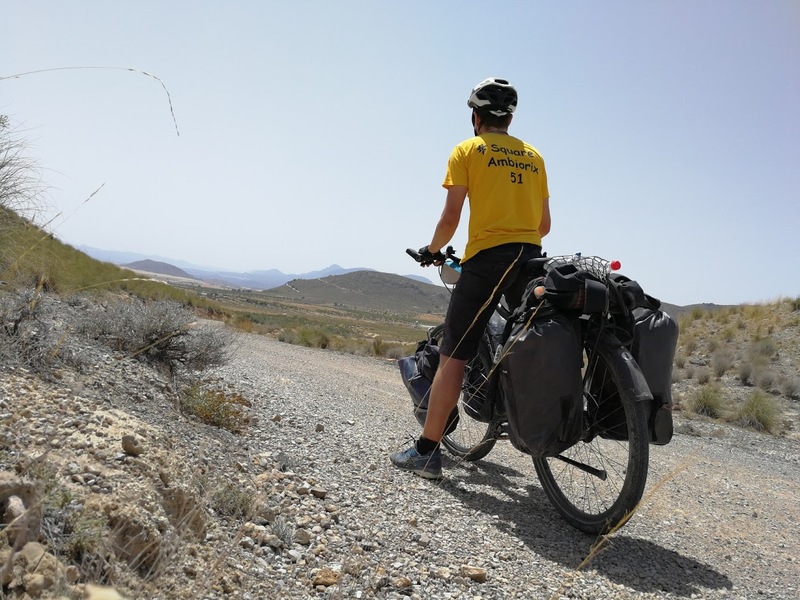 Both trips all by myself, but met many, many interesting people and other bicyclists on the way – some of them from the USA that I’m still in contact with 52 years later… Reading about your adventure (and it’s only the start!!) makes one feel young again! I wish you a safe trip – today the world isn’t what it was 50 years ago, but I’d like to share a funny experience that saved my day several times: I slept in barns most of the time (didn’t know anybody outside of Belgium…), and once asked the local police (Baden-Baden) to sleep in jail with my bike because I was afraid of being robbed in their neighborhood (they let me sleep in jail with one condition: if the local drunks were arrested that Saturday night I’d have to share my cell with them…(:>)….. But enough about me. Keep sending your messages – and know that in spirit I’m riding with you! Me gusta tu fotos. Creo que la vida es buena alli en que disfrutas de todo que pasa su camino. 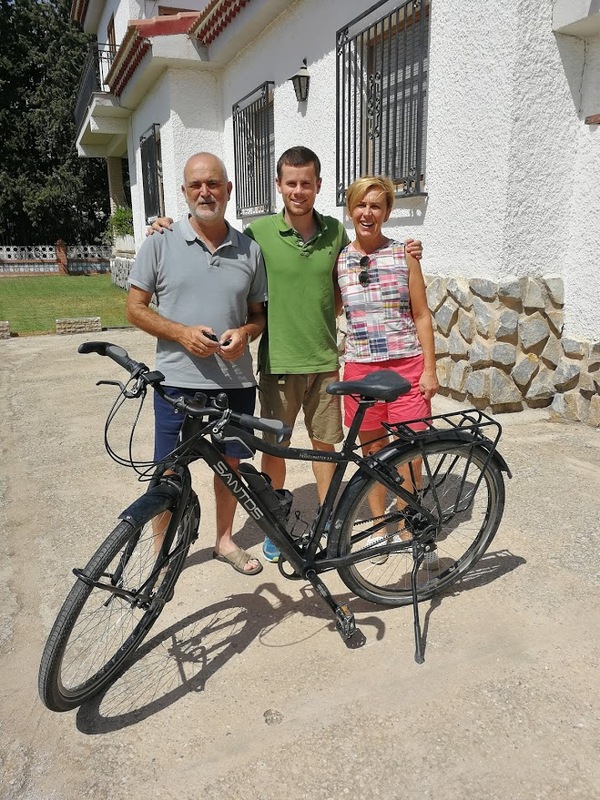 Este viernes voy a hacer una vuelta de bicicletta con su padre. Vamos a Zeeland. Hallo, ik hoop dat u het mij niet kwalijk neemt dat ik antwoord in het Nederlands. Om uw verhaal te lezen lukt me wel maar om tekst te schrijven zou me dit niet lukken. De reis tot en met Barcelona is mij bekend. Verder in die richting is het mij nog niet vertrouwd. 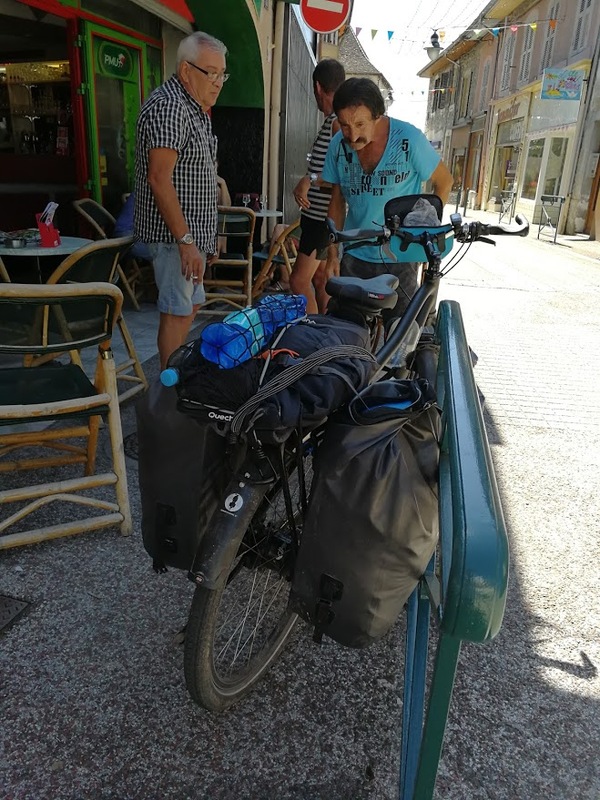 De noordkant van Spanje is me beter bekend tot Compostella. 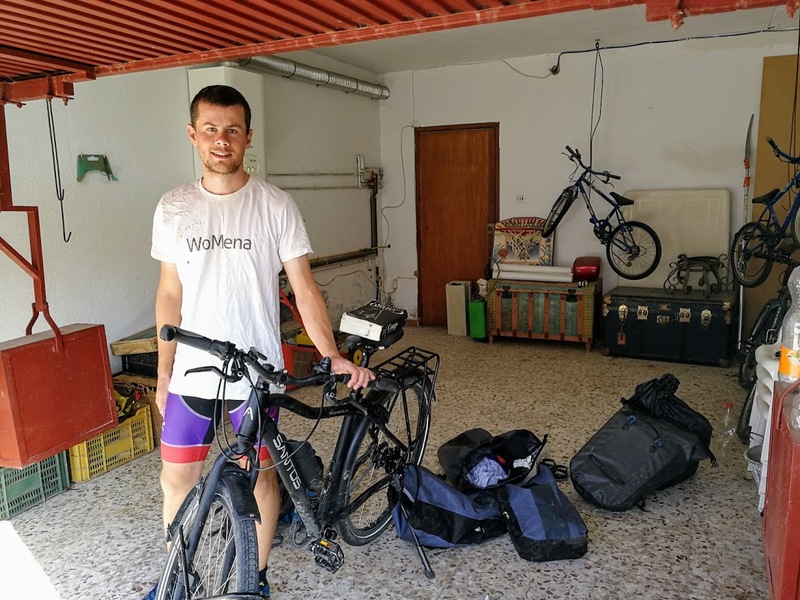 Na een maand 3200 km is goed gefietst kerel. Het voordeel van alleen te fietsen is dat u veel vrijer bent. Het doet jou gemakkelijker contacten maken met andere mensen. Zeer boeiend en meestal zeer aangename ontmoetingen. Doe zo verder, ik volg jou zoals zovele anderen met spanning hoe uw tocht verder verloopt. Je nadert Afrika met rasse schreden, we zijn benieuwd. Bedankt voor het delen van uw ervaringen Daniel. Ik neem morgen de boot en hoop nog meer boeiende dingen te posten binnen een paar weken ! Bedankt voor het uitgebreide verslag en de schitterende foto’s ! Blijf ervan genieten en succes ! schitterend dat je mijn blog volgt! ook het beste voor jou gewenst! Weer genoten van je verslag. Mijn benen doen al pijn als ik de route nog maar bekijk op google maps. Nice to read you and to admire your beautiful pictures.